I was feeling relaxed and prepared. Most of us aim to be this way at big competitions, but I now realize, there is such a thing as being too laid back. Before our first run, it began to rain, so I set up tarps on our tent, and then went to check the gate list. When I did, my friend Kelly yelled “Miles is up in three dogs! RUN!” I rushed back to our tent, grabbed Miles, let him pee, and ran all the way to the ring, and pretty much straight in. As you can imagine, this is the worst way to enter the ring with a wild wiry terrier! Miles was excited and geared up, and didn’t care what the plan was. After a painful run peppered with FOUR wild off-course jumps, my friend Cari-Anne came up to me. Cari-Anne has won multiple Regional and Nationals with her awesome dog Gadget, and has been watching us since the we started. “Miles can be so hard on you,” she said. “You were giving him the clearest, timeliest directions, and he just said ***k you!” Showing my mom the shaky video of the run a friend captured, my mom said (and she is not a rough speaker), “Hmmm.. Well he’s not being mean about it, like ‘***k you,’ he’s just like, “***k it! Sometimes I don’t care what you think!” It made us both laugh… Once when my sister was very little, my mother came home to find the walls lined with a disgusting looking trail of brown acrylic paint. My mother asked my sister what she was thinking when she did it, and told her it made her very unhappy. My sister, in her teeny little voice, shot back with conviction, “Sometimes little kids don’t care what makes their parents happy!” Miles and I scored a big fat 0 on that run. The Gamble on Saturday was easier than I Miles and I are used to. I have learned not to take “easy” things for granted in competition! The second you do, you under handle it, and voila, it is not easy. The opening was difficult to collect points in, and I did not attempt any mini gambles. We ended up with good opening points because Miles followed me, and Miles busted out a slamming final gamble. The first obstacle was a backside jump, something Miles has only learned as a skill in the last six months, and I was very proud of him for performing all of our practice under such pressure! We made the top 6 in this run at 4th place! We also had the 2nd fastest time in completing the final Gamble in our class, siding to the 1st dog with .2 more seconds. 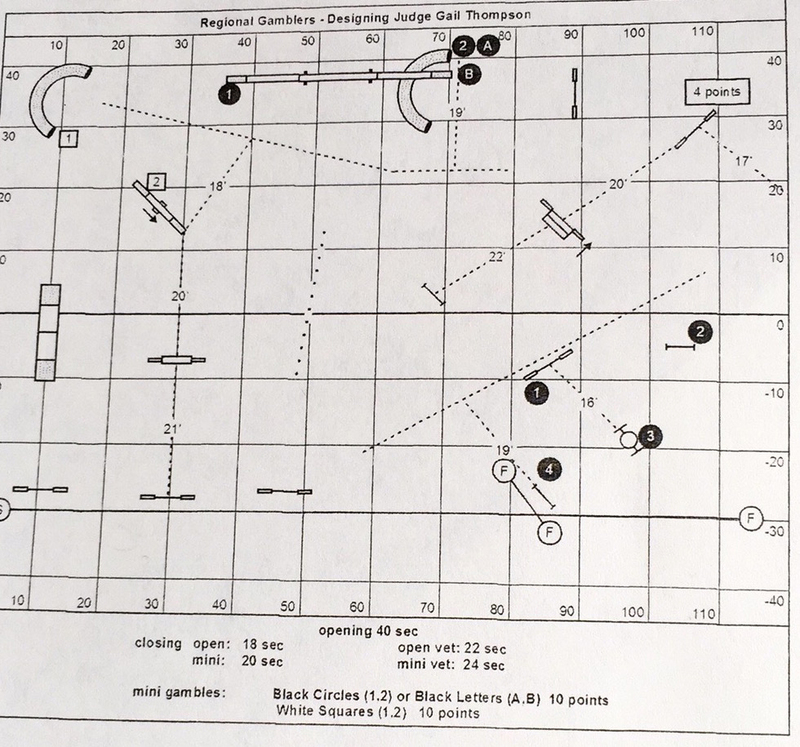 The course was almost a cross between a Masters Jumpers (challenging jump sequences) and a Standard (all obstacle course). Last year at Regionals and Nationals, we found Standard the most difficult, which is intimidating, because at these events Standard is worth the most points. We had a beautiful run, with the exception of Miles taking off, for his own pleasure, to catch an off-course jump. I guess he still had a taste of that joy from the first run? 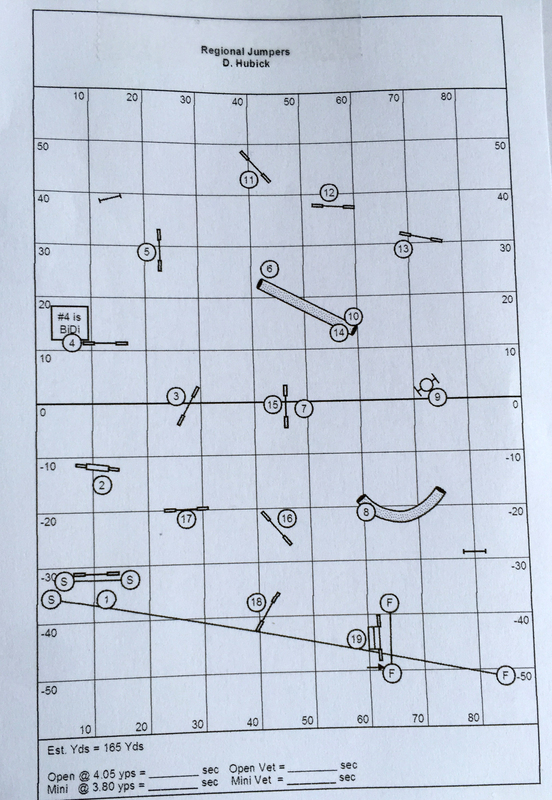 We did the course, even with Miles’ detour, in 21.54 seconds under time (54.46/76). If Miles had not taken the off-course, we would have been even faster AND been able to earn the bonus speed points. That is the nature of Regionals and Nationals — one fast mistake can cost you a ridiculous amount of points. The harder gamble of the weekend looked do-able to me. 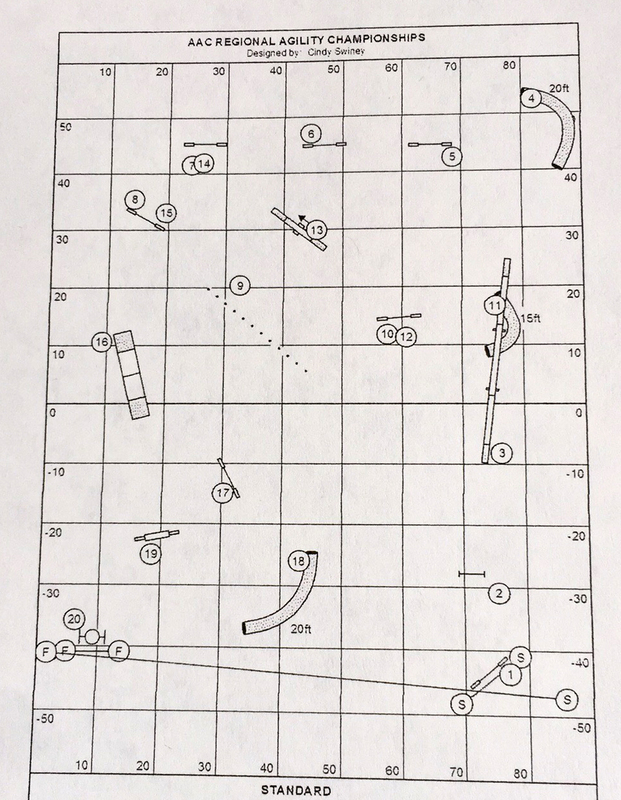 I plotted a great opening plan, the beginning of which would allow Miles to practice the skills needed for the closing. In the opening, Miles was erratic like he was in Jumpers, and my plan was not to be had. In the closing, I made the mistake of changing my plan of how to handle it, based on other’s recommendations, and Miles did what I was worried about, not understanding what I was trying to tell him. I should have trusted my gut! As my instructor says, there is a time and a place to try new things, and Regionals isn’t it! While I was warming Miles up, we walked by some dogs crated right by the rings, who were barking hysterically (which is very typical for agility!). I have never seen Miles do this — he became fixated on those dogs, as if they were saying something extremely distressing, and no matter what I did or where we walked, his head was turned staring at them. This all of course happened in the matter of about 1 minute, and right before our run. I desperately tried to have my friend distract Miles with bits of cheese and play, to no avail. I knew Miles was too distracted to compete, but I am not a primadona who is going to ask the gate to swap me in the order. I went into the ring, with Miles 100% distracted. Once that leash came off, I already felt it coming. Miles went right to the side of the ring, and stared outside, looking for the dogs. He was nice enough to be sternly opposed to the idea of leaving the ring (the open entry area was right there), but he was mean enough to cross the start line, and in doing so, turn on the timer. I did everything I could to get his attention, and finally, about 25 seconds later, we actually started the course. Miles stopped on obstacle #2, the A-Frame, to look for the dogs, and popped out of the weaves, obstacle #3, to look for the dogs, racking up course and time faults. He finally got into running with me, and ran #4 – #21 fantastically. He even followed me past the worst tunnel trap we have ever witnessed, much to my complete shock (and to those who know our tunnel struggles). I was dumbfounded leaving the ring. It was just pure and simple very very very bad terrier handler luck. After the freak bad terrier handler luck of Standard, I was prepared for the worst in our last run. On top of that, the sun had come out blazing, making Saturday’s downpours seem like a distant memory. Miles was hot, and acted like he might not start the run, and looked around before the start for a few seconds to see if those bad dogs were around. I got his attention after a few seconds, and we were off. 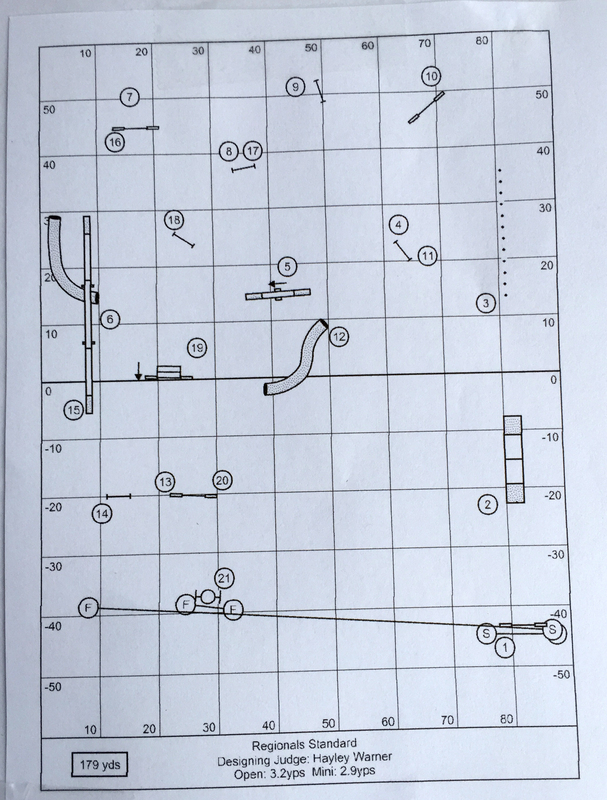 It was one of the hardest Jumpers we’ve Q’d to date. Course time was 56 seconds, and we did it in 42.38. We placed in the top 6 again for this run, at 5th place. Regular trials are challenging, but Regional and National events, which only each happen once a year, are a whole other level of pressurized competition. At Regionals and Nationals, a cumulative score from 6 runs earns you an overall aggregate score. At such events, when tough runs happen and bonk your good runs down, it can be easy to feel down, sad, frustrated. Especially when you’ve worked very hard, and you know what you are both capable of. There are all levels of competitors and human mentalities about competition at events like these. Miles and I have worked hard enough together to be really good, but we compete with me knowing Miles is from the lineage he is from — He’s a wildcard wild wiry terrier man. Our way of competing is a true way to represent team wild wiry terrier. It is all up to me to keep going strong, and work as hard as I possibly can, at every possible conceivable angle. Miles either wants to show what he can do, or he’d rather be a maniac. I won’t ever force him either way (human ideals of success, or failure), and that is the biggest simultaneous pain and beauty of our team. 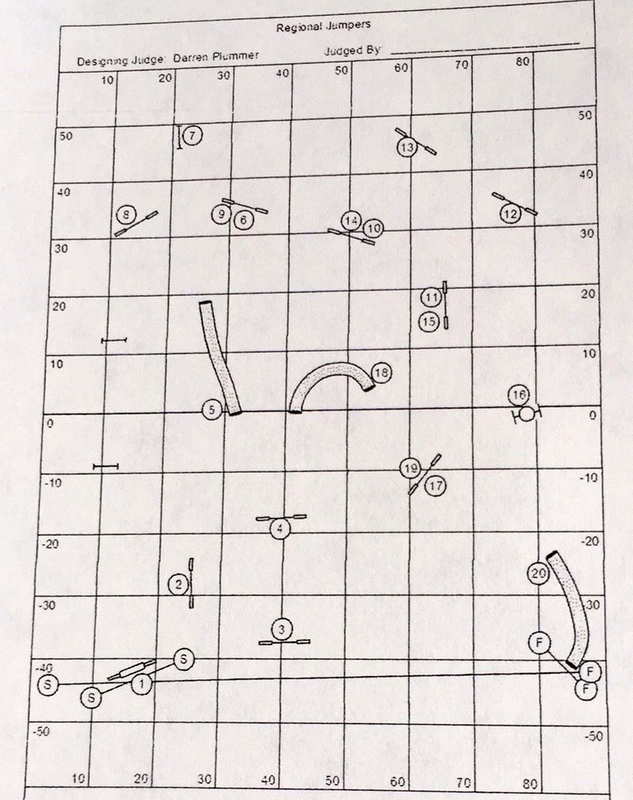 This is my first time doing agility, and I am determined to figure out, as I go, how to both constantly improve my handling, and ensure that my unconventional teammate always enjoys it as much as I do, as we progress as a team. It is a team sport, and I am determined to accomplish two levels of impossible with it for me and Miles: one, to do agility with a breed like Miles, and two, to retain the passion, wildness, and fire of his breed at a high level of competition, no matter what. No matter if you are working for top placements at a competition, or just working hard to have a good normal day with your wild wiry terrier, the goal should still be the same: it is how you handle them as a person that matters most. No wild wiry terrier is easy. Keep your “patience + persistence.” I am, and I think it is, and will be well worth it. First off – Happy Birthday Miles!!!!!! Second, despite the ups and downs – I still think you guys are amazing. What you manage to achieve with a terrier is so inspiring to all of us terrier owners. The fact that despite the very real frustrations from this weekend, that you are able to have such a fantastic outlook and see the positive is a testament to what a wise and generous person you are. And you did have some great positives and improvements for sure! That’s wonderful! I have always said when strangers ask about Oliver’s terrier personality/temperament that terriers have terrier focus – on whatever they choose to focus on at any given moment – and there’s no distracting them from it. It’s absolutely great if it’s focus on you and your agility commands, but many other times it’s focus on the hysterically barking dogs, or the cat on the other side of the fence, the sound they hear out the window, a skateboarder going by, or the crumbs just out of reach under the furniture. Sometimes it’s impossible to distract them from these things. I think this describes your team quite well – when Miles is focused on you – you can make magic happen! But sometimes, he’s focused on other things – the barking dogs or the extra jumps he feels compelled to do. But like you said, with patience and persistence – it can be very worth it! I’m sure you’re a bit disappointed to not have done better (because it sounds like without a few off-course and the distraction of the dogs that you did quite well! ), but it was still a job well done and a great experience. Hugs, always! Thanks Danielle, I sent the b-day wishes to Miles in the form of a treat! Happy birthday to Oliver too!! Your description of terrier distraction is very articulate, and accurate, I think! It always feels the best to be able to discuss such intense events with fellow terrier owners who really, truly, understand. I hope Oliver had a fantastic birthday. The pictures really made me laugh! I laughed when i read about Miles focusing on the barking dogs and doing an off-course jump just for fun. It’s all so very Welshie. Sounds like Miles had a good time. Best wishes to Miles for a happy birthday. Ha! I am so pleased my pain is good for something! I am sure you can enjoy it thoroughly because you know the mischievous ways of the Welsh terrier! I am sure Otis (and Oliver, with Danielle above) would be rooting Miles on in his wild moments if they knew! And yes, Mr. Miles had a blast. I used to get visibly disappointed when he was crazy, and when he began to recognize my sadness, in turn, he’d get sad and nervous too. I’ve learned from experience that a happy wild man is better than a worried wild man. Ah the mental game of being a Welsh Terrier’s teammate in agility is quite complex! 🙂 Hugs to you and Otis!